For the past seven years, Syria has been embroiled in civil war which has been exacerbated by the government’s use of chemical weapons against the people. 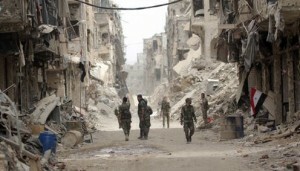 The war, responsible for at least 500,000 deaths, has consumed the attention of people around the world, not only due to its significance for the Syrian people but also because of the simultaneous rise of ISIS, the involvement of opposing world powers such as the United States and Russia, and the refugee crisis that it has sparked. Now, after a long seven years, many believe that the war is coming to a close. For the past two years, the regime of President Bashar al-Assad, with the help of Russia and Iran, has taken control of several rebel strongholds one city at a time. The capture of Daraa this July has had large symbolic significance as the civil war began there in 2011, when a group of boys graffitied the words ‘the people will topple the regime’ on their school. It served a center for rebels throughout the war, but as American forces were withdrawn, it was overtaken. Many analysts viewed this as the beginning of the end. Now, about three months later, the province of Idlib is the last remaining rebel stronghold. Assad announced plans for the launch of an offensive attack on the city but was unable to actually organize the forces necessary to achieve such a victory. On September 17, Turkey and Russia reached an agreement to both patrol Idlib. The agreement does not guarantee a cessation of violence, , but it did lead many rebel groups to withdraw their troops from the area. It is unclear what the future of Idlib will be exactly, but it is fairly clear to most that regime control of the province would signal an end to the war. It is unlikely that an end to official conflict will bring peace to the nation or end the suffering of the Syrian people. The economy has been devastated by a combination of the conflict itself and sanctions, with infrastructure destroyed, production decreasing, and a significant decrease in labor. Moreover, ending the war cannot keep extremist groups like ISIS at bay. On October 4, the terrorist group threatened to execute hostages unless the Assad regime stopped their attacks, and on October 11, it captured about 90 women and children. In terms of the power structure, an end to the Syrian civil war could, at this point, only be one in which President Assad maintains his corrupt leadership, at least for some period of time. Some believe that national instability will push him out of power and lead to the introduction of a new corrupt regime. In the meantime, UN special envoy Staffan de Mistura said the international community will work toward the introduction of a new constitution for Syria before he steps down next month. A new constitution would be a significant step in ending the civil war, de-escalating tension, and producing real change. A committee is set to meet to discuss the issue next week in Damascus. Reaching an agreement will be difficult, but it is the best hope for the next steps in Syria’s changing political structure.